JUST picture all that trash. For its 2017 International Coastal Clean-Up, Ocean Conservancy mobilized over half a million people to collect 8,346,055 kg of trash over more than 24,000 km of coastline worldwide. This included over 1.8 million cigarette butts and 1.5 million plastic bottles, according to the organization’s report. Unfortunately, some countries in the Coral Triangle are contributing significantly to this volume. Recent reports, including information from the environmental organisation Greenpeace, have identified the Philippines as one of the world’s top plastic polluters. “Because of plastic debris, we are altering the most important ecosystem of our country, which are our coastal regions,” says WWF-Philippines President and CEO Joel Palma. 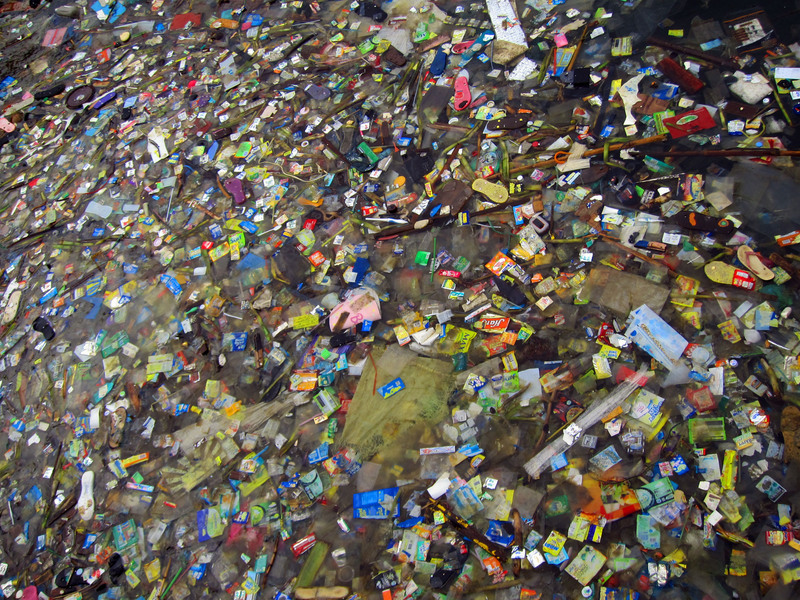 “Already, scientists are saying that in a few decades, there will be more plastic in our oceans than fish." 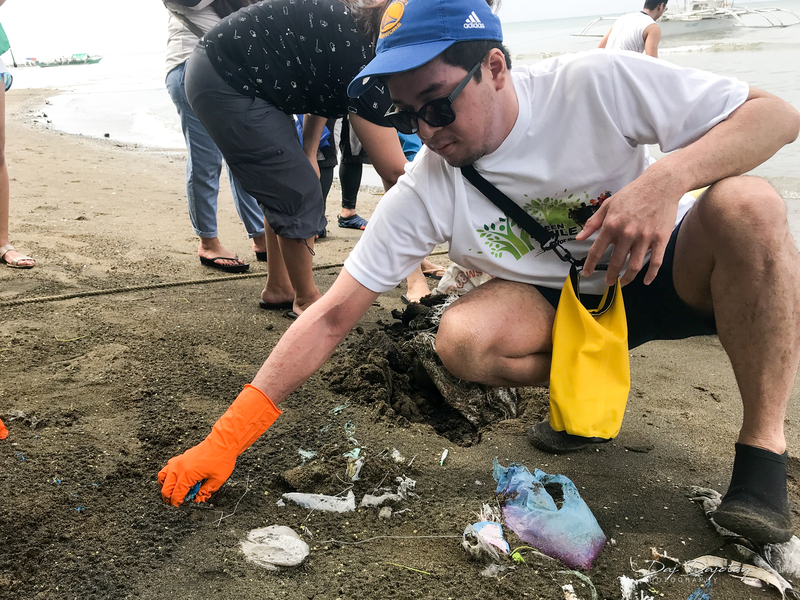 WWF-Philippines has taken action by working with partners in conducting coastal clean-ups to address marine debris, or the waste and other foreign materials ending up in the oceans. “WWF is raising awareness both online, through social media posts, and offline, through environmental education sessions in schools, communities, and institutions,” says Dan Ramirez, Communications and Media Manager of WWF-Philippines. “Transformative corporate partnerships are also being pursued to lessen the usage of single-use plastics." Last March, WWF-Philippines held a coastal clean-up activity in Donsol, Sorsogon, home of the Donsol whale sharks, where 76 kg of trash—mostly cigarette butts and plastic food wrappers—were collected. 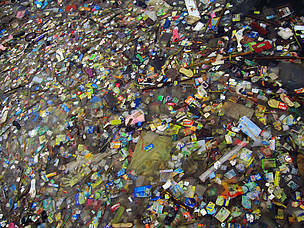 Two main factors can be blamed for such tremendous amounts of garbage in this archipelago, particularly plastics. First, mainly because of poverty levels, people still buy many products in small amounts—cheaper, but resulting in much more waste. “As the Philippines is one of the so-called ‘sachet economies,’ most of the debris gathered during clean-ups are plastics, including single-use sachets for shampoo, toothpaste, creams, laundry soap, and even food,” Ramirez notes. Because these are easy to sell—ribbons of single-use products hang from neighbourhood stores even in the most remote communities—large multinational manufacturing companies continue to market them. Second is improper waste disposal, still the main reason for the overwhelming amount of marine debris in the waters of the Philippines. Based on reports by WWF-Philippines, the country’s National Solid Waste Management Commission, and the World Bank, a whopping 74 per cent of plastic leakage comes from waste that has actually been collected. For example, of 2.7 million tonnes of garbage, 2.27 million tonnes are collected per year. Of this, 386,000 tonnes are still leaked into the ocean, mainly because of hauler dumping, when private hauler companies unload their trucks into water bodies on the way to proper disposal sites in order to cut costs, and because of poorly located dumps situated near waterways. Meanwhile, uncollected garbage in informal settlements is haphazardly dumped, while small communities living near rivers and water bodies dispose of personal waste directly into the waterways. 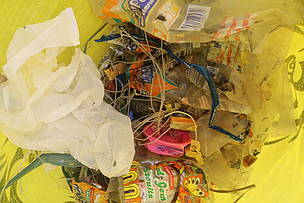 Marine debris affects both human and natural systems. “Ingestion and entanglement in plastics in the ocean have been documented in marine wildlife such as seabirds, turtles, and marine mammals,” says Ramirez. “Humans face the danger of ingesting persistent organic pollutants (POPs) through eating seafood, as this links to the food chain. Plastics absorb polychlorinated biphenyls (PCBs) and dichlorodiphenyltrichloroethane (DDT), which are POPs that directly affect human health." On the government level, the Department of Environment and Natural Resources- Biodiversity Management Bureau (DENR-BMB) has made dealing with marine litter a major component of coastal and marine projects. In communities like Donsol, local government is actively pushing awareness on Reduce, Reuse, Recycle principles; plastic is now being recycled and transformed into materials used to construct benches. It is also up to local governments to provide policies, as well as economic incentives, on another constant polluter in coastal areas, ghost nets and abandoned fishing gear. Standardising the use of bamboo crab pots, for example, would offer a more manageable alternative to nets. Expectedly, the distinction of being a leading plastic polluter is not good news to WWF-Philippines. “We hope this makes Filipinos more conscious of their single-use plastic consumption,” Ramirez says. “In line with this, WWF is preparing to launch a holistic campaign against single-use plastics that aims to influence perceptions and decisions of the general public, businesses, and policy makers to work together to address the country’s alarming problem with single-use plastics that pollute the oceans, threaten marine biodiversity, and affect humanity.